The storybook, Alice's Adventures in Wonderland was written by the English writer & mathematician, Charles Lutwidge Dodgson (1832-1898), who is also known as Lewis Carroll. The first ever edition was published in 1865 by Macmillan and Co. in London. The title was also popularly known as Alice in Wonderland - a story about a girl named Alice who follows the rabbit until she falls down into a big hole beneath a broken, old big tree and finds herself in a fantasy world that, according to her, only appears in her dream. There she sees various animals and bizarre creatures that talk just like humans. She faces quite an ardous task of fighting the monster and bringing the glory back to the White Queen, a mission she doesn't have a choice to decline. 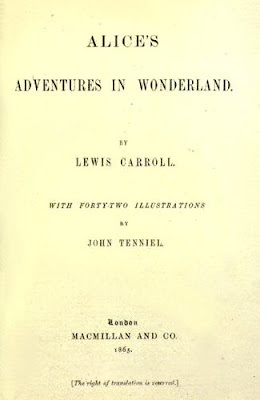 "Lewis Carroll" was the pseudonym that the writer created for himself by translating his first and middle names into Latin, reversing their order, and translating the words back into English. That must have been difficult to think over, don't you think? He decided to use this pseudonym in 1856 when he had begun writing humorous texts and stories to distinguish from his formal, scholarly writings in the field of Mathematics, which he published under his real name. Charles Lutwidge Dodgson unexpectedly died of pneumonia in January 1898. It's amazing to know that this adventure story has been rewritten, adapted, restaged and made into films in many different approaches. The story was translated into 125 languages and has been one of the favourite children's stories ever published. I remember that I have watched an animated film version on a Betamax tape way back in the early 1980's. Watching the premiere night of Alice in Wonderland in Disney Digital 3D format at SM Megamall Cinema 1 (Ortigas, Pasig City) on March 3, 2010 was a joy to behold. I rarely able to watch movies in 3D that is why it's a precious treat for my discriminate eyes on films. It's another achievement being added on Tim Burton's career as a filmmaker and visionary director. His other magnificent films were: Edward Scissorhands, Nightmare Before Christmas, Beetle Juice, The Sleepy Hollow, and Sweeney Todd. 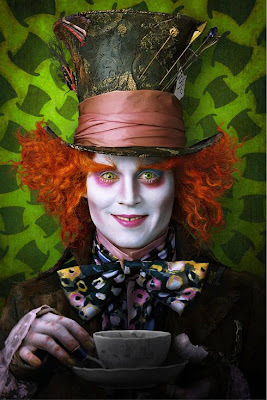 Johnny Depp plays the role of the Mad Hatter and Mia Wasikowska as Alice. The other important characters are: Red Queen, White Queen, White Rabbit, Tweedledee and Tweedledum, the Dormouse, the Caterpillar, the Cheshire Cat, etc. This film has excellent, brilliant graphics; colors are very vibrant! Both children and adults will surely adore this breathtaking masterpiece! I love adventure stories but Alice going to the Wonderland seems abrupt in the story. The film must have also revealed the time she spent in Wonderland (like in the Harry Potter series) equivalent to the time in the real world. When she came back to reality, yes, the family & friends asked her what happened, but never wondered really what took her so long to return. Watch Alice in Wonderland in Philippine theaters nationwide beginning March 5, 2010.